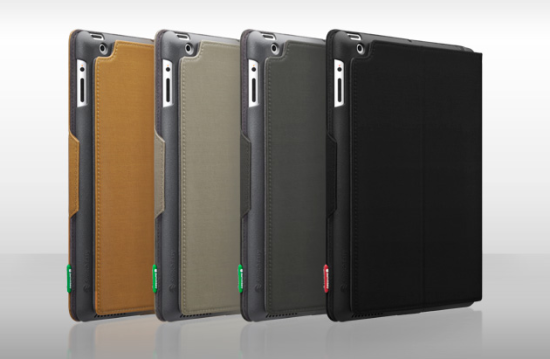 SwitchEasy has announced a new folio style case for the iPad 2 called the Canvas. The Canvas for the iPad 2 is a hybrid folio style protective case with an outer water-resistant and scratch-resistant matte canvas material and an inner polycarbonate plastic shell with padded microfiber lining. The Canvas employs a magnetic latch to lock and awake the iPad 2 like the Smart Cover. You can set your iPad 2 in a few landscape angles to view movies and the good thing is you will always be able to take pictures with the back facing camera even when you flip the front flap back. The Canvas folio is available now in 4 colors for $49.99.